I’m Debbie Hogg, The Self-Worth Coach. For years people have said to me, ‘You need to write a book’. As we get older we get wiser, so the saying goes. As we get older we have little reminders of how fast time goes by and how we pass from this amazing planet. I’m a collector of quotes and have started with 13. 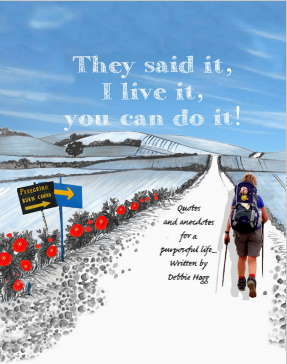 These life-changing quotes and some of my life and travel experiences, from Papua New Guinea to Camino de Santiago in Spain. These Stories are wrapped up in some beautiful art and pieces you can colour in to make your own. This little book enables you to take notes, journal, flick back and forth, keep close and draw on. There is value in other people’s stories and wise words. Take the book to heart and read some of my best nuggets wrapped in simple tools and techniques which you can apply to create all you want in life. You can even check your progress and thoughts whilst reading. Life is Life and it certainly knows how to deal up some serious ‘stuff’ at times. Do we get through it? Yes we do! Is it Challenging, difficult, horrible, tricky, upsetting or incredibly frustrating? YES! Can we do anything about whatever it is? Maybe yes, maybe no. Can we shift our attitude in how we deal with it? ABSOLUTELY. The intention behind these little adventures or challenging stories is to pass on tools and strategies for making Shift Happen. The power of the mind is where it all starts. Have a wonderful journey as you bring this little book along on your adventures. What is next for you? The Journey has just begun. Fill-up the form below to grab your free sneak-peek!